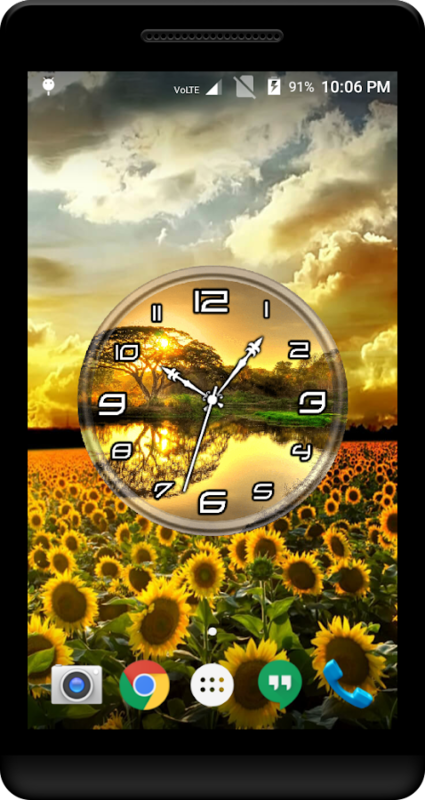 Sunset clock live wallpaper shows a high quality analog clock.Thisis Most Beautiful Sunset Clock Live Wallpaper. Sunset Clock LiveWallpaper is the best wallpaper app that has wonderful pictures.Set Sunset Clock as your Live Wallpaper to give a rich &patriotic look to your mobile.Sunset Clock Live Wallpaper Features:♥ Make your own clock with this amazing Analog Clock Livewallpaper!♥ The awesome analog clock Live Wallpaper also saves yourbattery!♥ Choose different background for display clock. ♥ Adjustvarious size of display clock as per your conception. ♥ Choose anyclock face.♥ Choose any hands and digits whatever you like for eachclock.♥ Choose your own background from gallery.♥ Clear TimeDisplay.♥ Analog Clock Live Wallpaper is free.♥ Elegantly DesignedClocks.♥ Easy User Interface.♥ HD Clock Wallpapers.♥ It is fullyanimated. Music clock live wallpaper shows a high quality analog clock.Thisis Most Beautiful Music Clock Live Wallpaper. Music Clock LiveWallpaper is the best wallpaper app that has wonderful pictures.Set Music Clock as your Live Wallpaper to give a rich &patriotic look to your mobile.Music Clock Live Wallpaper Features:♥ Make your own clock with this amazing Analog Clock Livewallpaper!♥ The awesome analog clock Live Wallpaper also saves yourbattery!♥ Choose different background for display clock. ♥ Adjustvarious size of display clock as per your conception. ♥ Choose anyclock face.♥ Choose any hands and digits whatever you like for eachclock.♥ Choose your own background from gallery.♥ Clear TimeDisplay.♥ Analog Clock Live Wallpaper is free.♥ Elegantly DesignedClocks.♥ Easy User Interface.♥ HD Clock Wallpapers.♥ It is fullyanimated. Night clock live wallpaper shows a high quality analog clock. Thisis Most Beautiful Night Clock Live Wallpaper. Night Clock LiveWallpaper is the best wallpaper app that has wonderful pictures.Set Night Clock as your Live Wallpaper to give a rich &patriotic look to your mobile.Night Clock Live Wallpaper Features:♥ Make your own clock with this amazing Analog Clock Livewallpaper!♥ The awesome analog clock Live Wallpaper also saves yourbattery!♥ Choose different background for display clock. ♥ Adjustvarious size of display clock as per your conception. ♥ Choose anyclock face.♥ Choose any hands and digits whatever you like for eachclock.♥ Choose your own background from gallery.♥ Clear TimeDisplay.♥ Analog Clock Live Wallpaper is free.♥ Elegantly DesignedClocks.♥ Easy User Interface.♥ HD Clock Wallpapers.♥ It is fullyanimated. Red clock live wallpaper shows a high quality analog clock. This isMost Beautiful Red Clock Live Wallpaper. Red Clock Live Wallpaperis the best wallpaper app that has wonderful pictures. Set RedClock as your Live Wallpaper to give a rich & patriotic look toyour mobile. Red Clock Live Wallpaper Features: ♥ Make your ownclock with this amazing Analog Clock Live wallpaper! ♥ The awesomeanalog clock Live Wallpaper also saves your battery! ♥ Choosedifferent background for display clock. ♥ Adjust various size ofdisplay clock as per your conception. ♥ Choose any clock face. ♥Choose any hands and digits whatever you like for each clock. ♥Choose your own background from gallery. ♥ Clear Time Display. 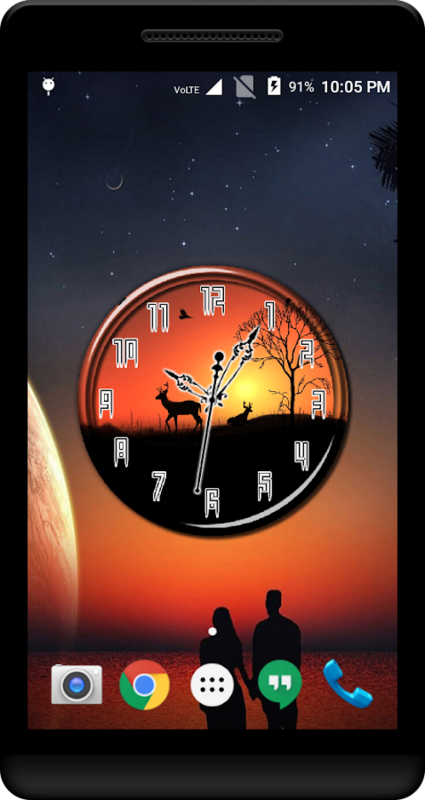 ♥Analog Clock Live Wallpaper is free. ♥ Elegantly Designed Clocks. ♥Easy User Interface. ♥ HD Clock Wallpapers. ♥ It is fully animated. Aquarium clock live wallpaper shows a high quality analog clock.This is Most Beautiful Aquarium Clock Live Wallpaper. AquariumClock Live Wallpaper is the best wallpaper app that has wonderfulpictures. Set Aquarium Clock as your Live Wallpaper to give a rich& patriotic look to your mobile. Aquarium Clock Live WallpaperFeatures: ♥ Make your own clock with this amazing Analog Clock Livewallpaper! ♥ The awesome analog clock Live Wallpaper also savesyour battery! ♥ Choose different background for display clock. ♥Adjust various size of display clock as per your conception. ♥Choose any clock face. ♥ Choose any hands and digits whatever youlike for each clock. ♥ Choose your own background from gallery. ♥Clear Time Display. 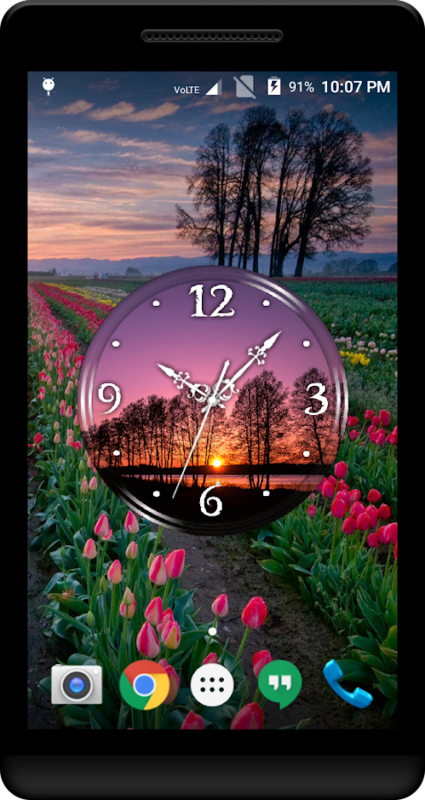 ♥ Analog Clock Live Wallpaper is free. ♥Elegantly Designed Clocks. ♥ Easy User Interface. ♥ HD ClockWallpapers. ♥ It is fully animated. UK clock live wallpaper shows a high quality analog clock. This isMost Beautiful UK Clock Live Wallpaper. UK Clock Live Wallpaper isthe best wallpaper app that has wonderful pictures. Set UK Clock asyour Live Wallpaper to give a rich & patriotic look to yourmobile. UK Clock Live Wallpaper Features: ♥ Make your own clockwith this amazing Analog Clock Live wallpaper! ♥ The awesome analogclock Live Wallpaper also saves your battery! ♥ Choose differentbackground for display clock. ♥ Adjust various size of displayclock as per your conception. ♥ Choose any clock face. ♥ Choose anyhands and digits whatever you like for each clock. ♥ Choose yourown background from gallery. ♥ Clear Time Display. ♥ Analog ClockLive Wallpaper is free. ♥ Elegantly Designed Clocks. ♥ Easy UserInterface. ♥ HD Clock Wallpapers. ♥ It is fully animated. Macaron clock live wallpaper shows a high quality analog clock.Thisis Most Beautiful Macaron Clock Live Wallpaper. Macaron Clock LiveWallpaper is the best wallpaper app that has wonderful pictures.Set Macaron Clock as your Live Wallpaper to give a rich &patriotic look to your mobile.Macaron Clock Live WallpaperFeatures: ♥ Make your own clock with this amazing Analog Clock Livewallpaper!♥ The awesome analog clock Live Wallpaper also saves yourbattery!♥ Choose different background for display clock. ♥ Adjustvarious size of display clock as per your conception. ♥ Choose anyclock face.♥ Choose any hands and digits whatever you like for eachclock.♥ Choose your own background from gallery.♥ Clear TimeDisplay.♥ Analog Clock Live Wallpaper is free.♥ Elegantly DesignedClocks.♥ Easy User Interface.♥ HD Clock Wallpapers.♥ It is fullyanimated. Owl clock live wallpaper shows a high quality analog clock.This isMost Beautiful Owl Clock Live Wallpaper. Owl Clock Live Wallpaperis the best wallpaper app that has wonderful pictures. Set OwlClock as your Live Wallpaper to give a rich & patriotic look toyour mobile.Owl Clock Live Wallpaper Features: ♥ Make your ownclock with this amazing Analog Clock Live wallpaper!♥ The awesomeanalog clock Live Wallpaper also saves your battery!♥ Choosedifferent background for display clock. ♥ Adjust various size ofdisplay clock as per your conception. ♥ Choose any clock face.♥Choose any hands and digits whatever you like for each clock.♥Choose your own background from gallery.♥ Clear Time Display.♥Analog Clock Live Wallpaper is free.♥ Elegantly Designed Clocks.♥Easy User Interface.♥ HD Clock Wallpapers.♥ It is fully animated. Juice clock live wallpaper shows a high quality analog clock.Thisis Most Beautiful Juice Clock Live Wallpaper. Juice Clock LiveWallpaper is the best wallpaper app that has wonderful pictures.Set Juice Clock as your Live Wallpaper to give a rich &patriotic look to your mobile.Juice Clock Live Wallpaper Features:♥ Make your own clock with this amazing Analog Clock Livewallpaper!♥ The awesome analog clock Live Wallpaper also saves yourbattery!♥ Choose different background for display clock. ♥ Adjustvarious size of display clock as per your conception. ♥ Choose anyclock face.♥ Choose any hands and digits whatever you like for eachclock.♥ Choose your own background from gallery.♥ Clear TimeDisplay.♥ Analog Clock Live Wallpaper is free.♥ Elegantly DesignedClocks.♥ Easy User Interface.♥ HD Clock Wallpapers.♥ It is fullyanimated. Simple and nice night analog clock with alarm and modern metaldesign. Night clock application can be used also as a night light.Settings: - To set up repeated alarm just tap on the alarm button -red color and select alarm time, to clean and cancel alarm tapagain - button will change to green color. - To change clock colorswipe left or right. - Double tap to change the background fromblack to white/high brightness - night light. - Tap to the centerof the clock to turn on/off second hand. - You can changebrightness to save energy if the clock is always on. Go to menu to- Turn on/off clock tick. - Set time and date. - Set your own clockcolor. this timer analog and digitalclock have 12 hour & 24 hour analog clock as live wallpapersfor any smart phone. you have the best Calendar of the year inyour choice format. If you want to have it all then seize this opportunity and downloadAnalog Clock Live Wallpaper that will show the world your eleganceand sense of style. This analog watch looks fantastic on any phoneor tablet and there are numerous ways in which you can customizeyour own clock on display. You will be amazed with the fact thatthis analog watch shows time, date and battery power on your homescreen at the same time and it has exclusive hd backgrounds thatwill make your mobile device elegant and unique. Attractivespinning clock hands and a powerful interface will make you say wowwhen you unlock your screen. If you're a fan of free livewallpapers, this one is definitely worth a try. Download AnalogClock Live Wallpaper free of charge and check the cool features.Features: ✔ The awesome “analog clock” saves your battery life! ✔Make your own clock with this live wallpaper changer! ✔ Choose allthe watch elements separately! ✔ Choose background, clock ticks,hands and widgets! ✔ Preview your live clock background! ✔ Whenyou're done, sync the app with your device! ✔ Both round and squarewatches are supported! ✔ This is a real clock on display, not justan animated wallpaper! ✔ Simple to use, easy to configure and agreat look under your fingertips! Decorate your home screen with adashing “live clock wallpaper” with a superb color combination andattractive moving backgrounds that will look beautiful and stunningon your device. With realistic hd quality, specially built for thelatest phones and tablets, this “watch live wallpaper” will makeyour eyes glare in wonder. The “large clock display” is suitablefor those who have trouble with their vision or who want to haveeverything on the home screen in plain sight. Wonderful movingwallpapers and backgrounds with a real analog watch that shows dateand time is an ideal thing to give your mobile a dose of elegancyand style. It is the best app for phone personalization that willgive a rich look to your favorite gadget so download Analog ClockLive Wallpaper free of charge and enjoy! Transform your phonescreen into an extravagant item with a live clock for home screenand enjoy its practicality. Our designers made sure to create areal clock art using the best looking watch elements so this makesour “clock live wallpaper” 100% unique. You won't see any similardesign in any other live running clock wallpaper! What's more, yourphone or tablet will almost glow in the dark with the help of ourfree app 'cause the backgrounds and the watch face elementstogether make a glowing neon clock live wallpaper in your favoritecolor blue. We are glad to offer you the opportunity to change yourphone theme and get rid of that boring and sterile digital watchthat is so demode. There is no more time to waste; grab your deviceand download “Analog Clock Live Wallpaper” for free now! Changeyour custom background theme for astonishing “live watchwallpaper”! What makes our smart app for phones and tablets sospecial is the fact that you can choose a default skin from the“moving wallpaper” collection our designers have prepared, or makeyour own wallpaper theme by combining the elements according toyour own desires and needs. Choose a simple clock face or anelegant watch and change the background in the matter of secondsaccording to the occasion you're in. This “animated live clockwallpaper” will allow you to express your creativity and make youfeel one of a kind. Get your own Analog Clock Live Wallpaper, thebest looking “live wallpaper clock with date and time” and radiateconfidence wherever you go! ChinniKrishna analog clock live wallpaper is a wonderful gift toKrishna worshippers. Blue or dark colored deity Krishna is nowavailable in the form of live wallpaper to android mobiles.Download child Krishna LWP for free. You can find the chota krishnaplaying in the lap of mâa yashoda. Definitely you will love theimage of Navneet Chora Krishna steeling makhan from the pot, andthe prettiest face covered with makhan. Surely you attracted tochota krishna playing flute in his hands and a peacock feather onhis head. Features : ♡ 8 beautiful Krishna images ♡ 8 marvelousunique backgrounds ♡ 4 different clocks ♡ easy-to-use, just selectyour favorite image, then again go for selecting your loving clock♡ high quality live wallpaper drains very less battery Installationinstructions : Home - menu - wallpaper - live wallpaper -chinniKrishna analog clock. Krishna is also depicted and worshipped as asmall child (Bala Krishna, child Krishna, chota krishna, chinniKrishna, young Krishna), crawling on his hands and knees ordancing, often with butter or Laddu in his hand being Laddu Gopal,Gopikrishna stealing butter from neighbouring houses i.e. NavneetChora or Gokulakrishna. The birth of Lord Krishna is celebrated asJanmashtami, with great devotion in the August/September months, onthe Ashtami of Krishna Paksh or the 8th day of the dark fortnightin the month of Bhadon, in the whole of north India. Lord Krishnalived for 126 years and 5 months. He is often shown wearing ayellow silk dhoti and a peacock feather crown, Common depictionsshow him as a little boy, or as a young man in a characteristicallyrelaxed pose, playing the flute. Feel free to discuss with us, weare always welcoming you for your suggestions, to serve you thebest. Thank you, hope you feel the blessings of God and can prayevery minute through our live wallpaper. Clock Live Wallpaper , you can customize Clock like your style withCompass. Features: * Size of Clock (Small,Normal,Large) * Color ofClock(Text,Clock,arrow and Background) * Show (secondarrow,Date,Day,Month and Compass) * Change(Font,Shape ofclock,Potion Of Clock) How to use: To select this Wallpaper, LongPress the Home Screen > Choose Live wallpaper > and selectthis application > Click "Set as Wallpaper". Analog clock as application, live wallpaper and widget. Clockdisplays month and day of the week according to current language.There are two types of appearance: solid and gradient style. Touchon the widget to run app. Touch on the app screen to call menu.Settings: * Size of the clock (you can resize widget too); * Showsecond hand; * Show the current date, month, day of the week,battery charge; * Select primary, secondary and text colors; *Gradient or solid color style; * Change logo text; * Horizontal andvertical alignment for live wallpaper only; * Time to speech byinterval: 1, 5, 15, 30 or 60 minutes. Application, live wallpaper and widget looks like light analogclock. Settings: * Background and secondary colors; * Size ofthe clock; * Show second hand; * Show date, month andday of the week; * Show battery charge; * Time to speech byinterval: 1, 5, 15, 30 or 60 minutes. Your screen will be with beautiful analog clocks, which are morebattery friendly than many other live wallpapers. It makes you seethe time all the time when your screen is on! Share with yourfriends! Try a lite version to estimate the quality of thewallpaper! ♦ Clockfaces: - White (Default) - Black - Roman - Rometransparent - Digital ♦ Backgrounds: 5 different ones ♦ Correctingclock size ♦ Correcting clock position ♦ Seconds arrow modes:ticks, flowing or disabled (in the full version!) ♦ Date (in thefull version!) ♦ Quick settings ♦ Alarm launcher Additionalinformation: ♦ Wallpaper supports phones and tablets (landscape andportrait orientation) ♦ Battery saving: - Redrawing of clocksmaximum one time per second with seconds arrow enabled (in tickmode of seconds arrow, FPS limit in this case affects only toaccuracy of updating time) and one time per minute when disabled. -Consumption of resources is only if visible - Frames per secondlimit - Choosing of textures quality ♦ OpenGL ES 2.0 required Someof the described functions are only available when purchasing thefull version. An application can be extended to the full version bydownloading the paid version. When you taking in-app purchases, youget lifetime access to the acquired functions, even if your phonechanged or data is lost.